A late night trial of the mostly tourist-oriented South Perth ferry service will go ahead from December 16 in response to requests from local commuters. The Transperth ferries will run for an additional three hours Monday to Saturday, and an extra hour on Sunday adding 38 more return trips per week as part of a summer trial. That means weekday services will continue until 10.24pm, compared with the existing cut-off time of 7.24pm. Friday and Saturday nights will stop at 12.15am – previously 9.15pm – and Sunday and public holiday services will close at 8.24pm – previously 7.24pm. Western Australia’s Transport Minister Troy Buswell says the extended services will continue until April 30, 2013. "At the end of the trial, passenger numbers will be reviewed and a decision made on whether the new times should be adopted as a permanent change to the ferry’s summer timetable," Buswell says. 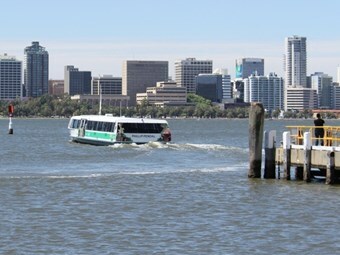 Each crossing from Barrack Street Jetty near Perth’s CBD across the Swan to South Perth takes seven minutes. The multi-billion dollar Transperth rail and bus operation has a fleet of just two ferries, the MV Shelley Taylor-Smith and MV Phillip Pendal, operated under contract by Captain Cook Cruises. A crossing costs $1.90 for a full paying adult or 80 cents for concession holders.